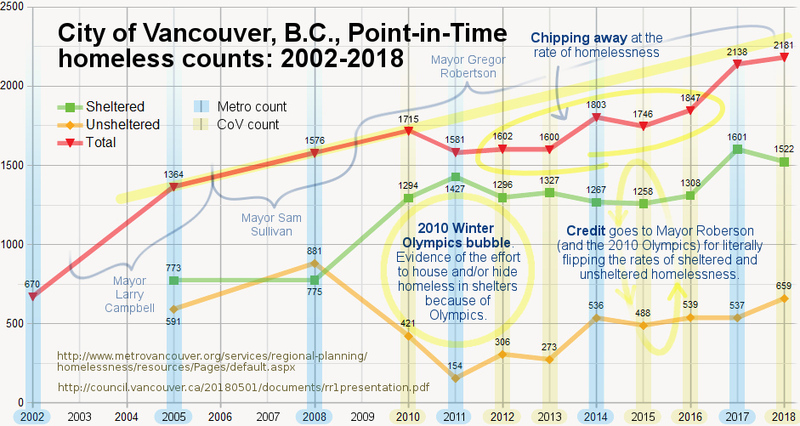 homelessness, point-in-time homeless counts, Vancouver B.C. The first day of summer homelessness. Yay! 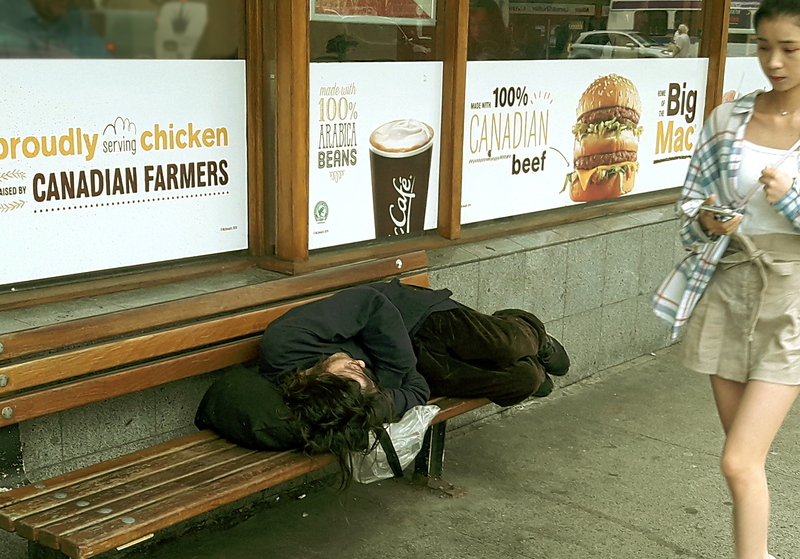 A homeless fellow ejected from McDonald’s curls up on a bus bench at 8:52 a.m., while a passerby focuses strictly on her phone. 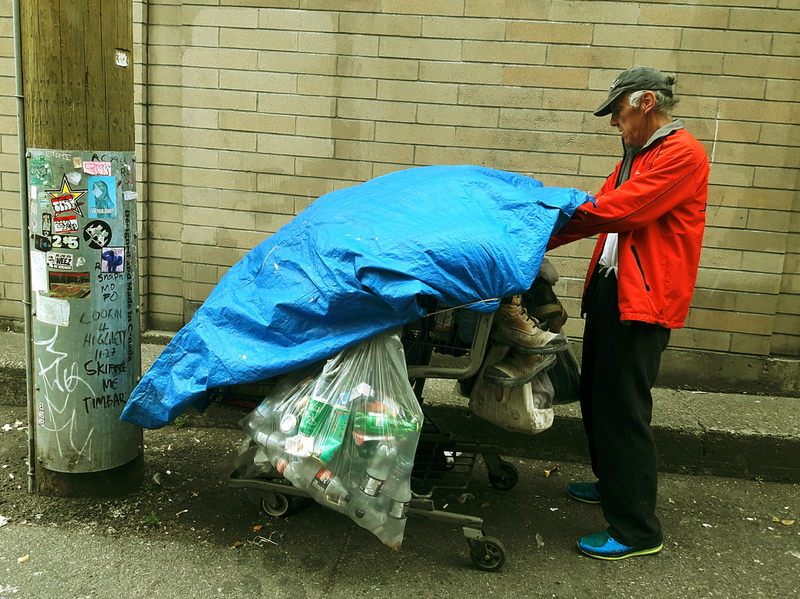 Thursday morning (June 21st) may have marked the start of the first official day of summer in Vancouver but for homelessness it was more-or-less business as usual. The only difference being that business (as they say) was booming—at least in the part of the Fairview neighbourhood where I breakfast most mornings. After leaving my own sleeping spot at around 7 a.m., I often see someone else bundled up and sleeping in the 1200 block of West Broadway Avenue. 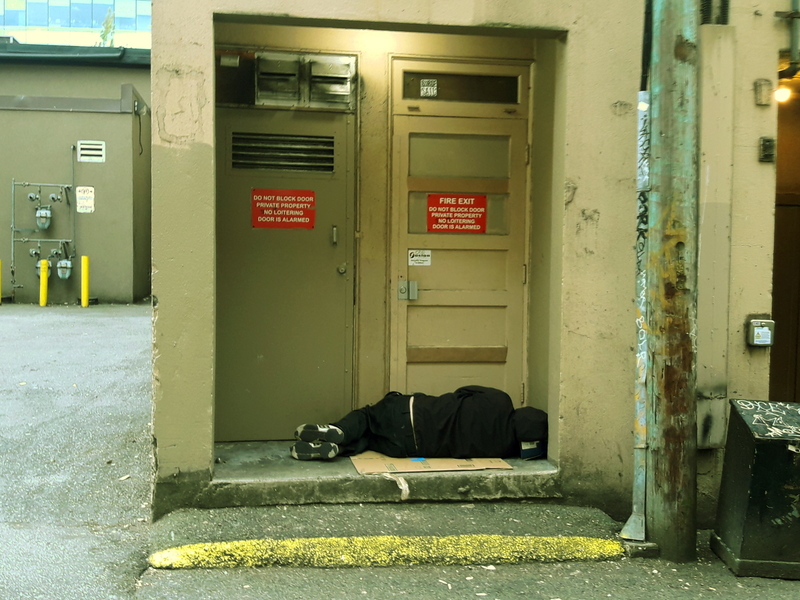 Thursday morning, though, I didn’t see my first rough sleeper until about 7:15 a.m.—in the 1400 block of the alley on the south side of West Broadway. 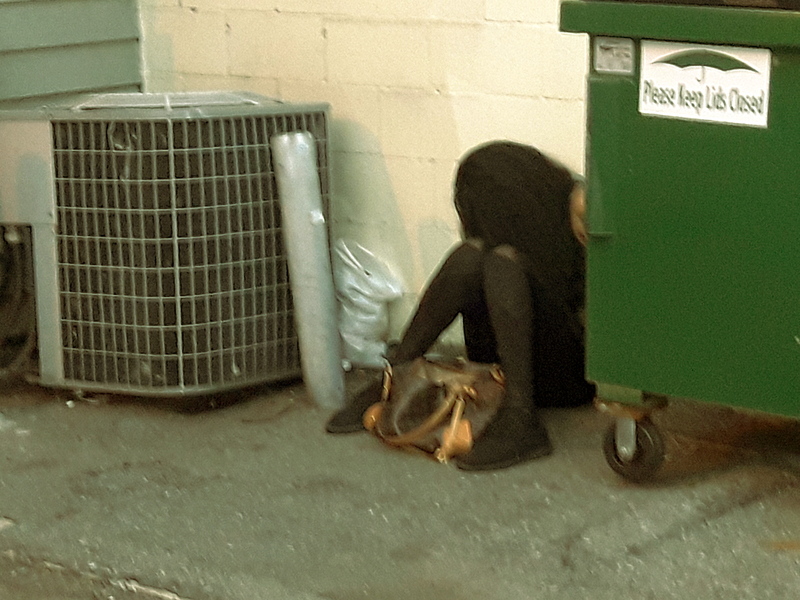 This was a woman, sitting hunched over in the narrow space between an air conditioning unit and a dumpster. I admit that I disturbed her rest, but only in order to make sure that she really was sleeping. Continuing on my way, next door I saw a couple with shopping cart and possessions, who were sleeping soundly in the loading bay behind Jordans Furniture. This was my homeless friend Henry and—judging by the henna-red hair curling out from under a blanket—his wife of many years, who occasionally leaves her social housing downtown, to join him for a few days on the streets of Fairview. He was curled up with his back to the neighbourhood residents who briskly passed him by without a glance. Most of these people were just focused on getting to Broadway Avenue—perhaps to get a coffee and breakfast at McDonald’s, or to catch a bus, or get to work, or perhaps all of the above. 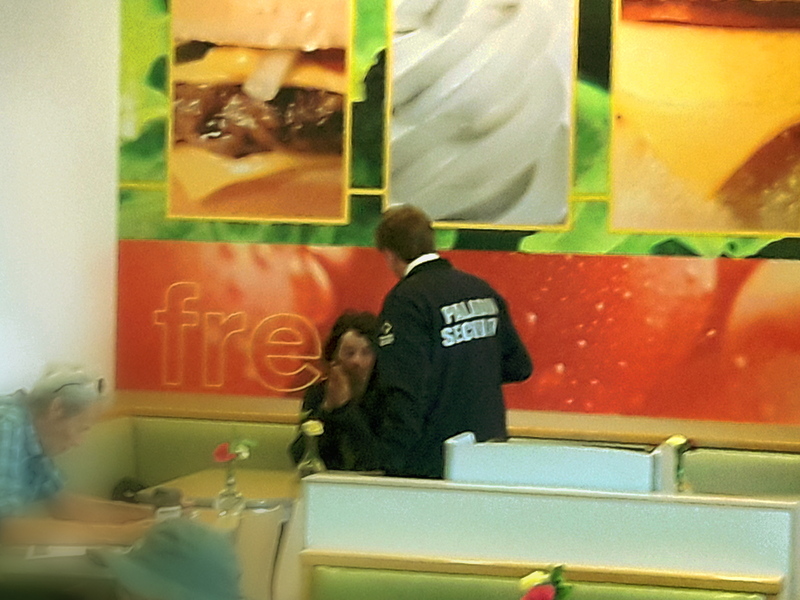 At 8:26 a.m., after a nearly two-and-a-half hour nap, a homeless man in McDonald’s gets his wake up call from a SGBIA-employed security guard. He had been there, it was said, since 6:00 a.m. and was well-known to the staff, whom he simply ignored. At 8:30 a.m., Henry—all bleary-eyed—having just decamped from the Jordans loading bay—shuffled into the McDonald’s and headed straight for the mens washroom, to complete his morning ablutions. Good morning indeed! Click the images to enlarge them. With warm weather, they are more visible staying out in open area. Thank goodness for summer. What I noticed they sleep during the day, stay awake at night. I suppose this way, it’s for safety reason. Do homeless people get together and have a think tank how to help each other as a community’s? Homeless people help those whom they are close to and like, the way friends do. We help the homeless people whom we don’t much like, the same way that farmers do — because they are part of the community and because we will need their help sooner or later. Well put, as was your other insightful response. Understanding each others burdens may be the only way to de-escalate this mess (that is not accidentally occuring). This is NOT a natural disaster, but it still is a disaster. Deadly for some. Thank you.